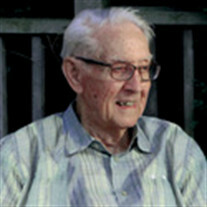 Obituary for Ernest M. Voss | Langeland Family Funeral Homes, Inc.
Just five weeks shy of celebrating his 100 years on this earth, Ernest M. Voss was quietly called home in his sleep on Monday, March 5, 2018. Ernie was born on April 8, 1918 and was the son of Benjamin and Mary (Glupker) Voss in Fillmore Township. He spent his early years in Holland, graduating from Holland Christian High School and the Holland Business Institute. As an Army Sergeant in World War II, he served as Company Clerk with the 126th Infantry, 32nd Division in Australia, New Guinea and in what was then the Dutch East Indies from 1941 to 1945. On August 13, 1947, he married Lucille Van Hoe in Kalamazoo, Michigan, where they built their home and raised their family. Upon moving to Holland in 2010, he continued as her faithful caregiver until her passing on December 6, 2011. Ernie was employed by the former Michigan Bell Telephone Company for 37 years, retiring in 1982 as a field engineer. After retirement Ernie enjoyed traveling and family genealogy, tracing the Voss family back to the 1600's. He was passionate about gardening and loved to share the fruits of his labor with family and friends. He volunteered in many capacities during his retirement years, including driving for the Red Cross. As a member of Bethany Reformed Church of Kalamazoo, he served as a deacon, mentor, long-time church treasurer and friend. Ernie and Lucille also hosted the church's fellowship time for many years. Ernie was a resident of the Warm Friend since 2012 and attended Central Avenue CRC. The family is grateful to the Resthaven community and Fresenius Dialysis Center for their exceptional facilities and their loving care. Preceding him in death are his wife, parents, three sisters and four brothers. He is survived by two daughters, Karen (Neal) Van Veen of Pella, IA and Nancy (William) Gezon of Holland; five granddaughters, Janna (Nick) Pearson of Holland, MI, Angie (Kyle) Kreger of Council Bluffs, IA, Lisa (Tim) Mroz of Grand Rapids, Jessica Bourgeous of Thousand Oaks, CA, Julie (David) Ornee of Holland. Ernie's nine great-grandchildren were a source of much joy in his later years. Also surviving is one brother-in-law, Donald Van Hoe of Kalamazoo. Friends may visit with the family from 10 - 11 a.m. on Friday, March 9th at Bethany Reformed Church, 1833 S. Burdick St., Kalamazoo, MI 49001, where the funeral service will follow at 11 a.m. Rev. David Zomer and Rev. Fritz Kruithof will officiate the service. A graveside service will be held at 1:30 p.m. in Mt. Ever-Rest Memorial Park, South. A memorial service will be held at 1 p.m. on Saturday, March 10th at The Warm Friend, 5 East 8th St., Holland, MI 49423, where friends are invited to visit with the family following the service. In lieu of flowers, memorial contributions may be given to the Alzheimer's Disease Research Center at Mayo Clinic, National Kidney Foundation or Bethany Reformed Church.